← January 17, 2013 – Shortnose Spearfish on the Fly! January 22, 2013 Big Ahis and Mahimahis Today! K.C and her husband Sheldon joined me for a full day. 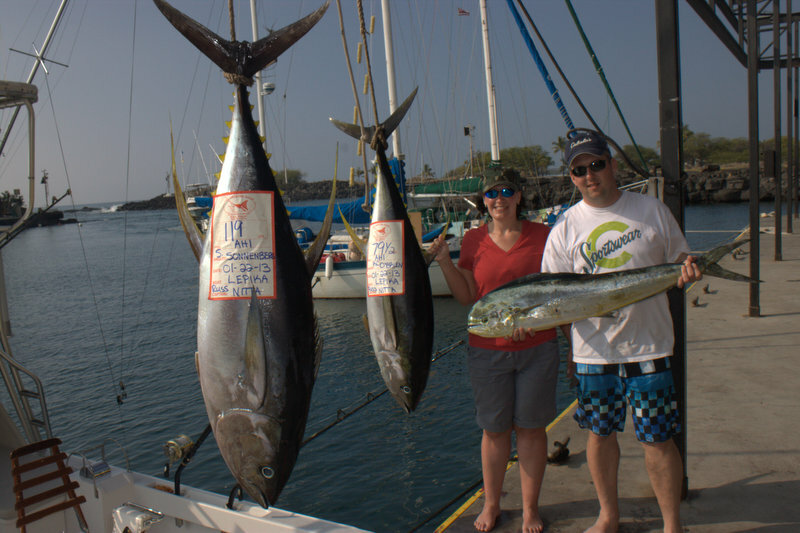 It was their first time to Hawaii and their first time deep sea fishing. They showed up to the dock at 7am and we got ready to push off when I realized I didn’t have my boat keys! I was in a panic as I tried to remember where I had put them. They weren’t on my key chain so I decided to drive home and look for them…UGH! I got to the harbor stop light and realized I didn’t check my flybridge so I turned around and sure enough there they were! We were off at 7:15! We headed out into the deep since most of the bites have been coming outside the 1000 fathom line. We headed south for a few hours without a bite and then I headed even deeper inhopes of running into some spearfish or striped marlin which have been on a pretty good bite lately. A splash on the horizon got my attention and we headed that way. It was big pod of porpoise! We made our first pass thru the pod and as I got near the end of the pile I marked two ahi on my sounder at 40 and 35 fathoms. I told KC and Sheldon to watch the lures and maybe we could get one to bite. a few seconds later a big ahi exploded on the short bait just thirty feet behind the boat. Line was leaving the reel fast and Sheldon got buckled into the harness! He worked the fish for about 15 minutes before getting me to the leader. 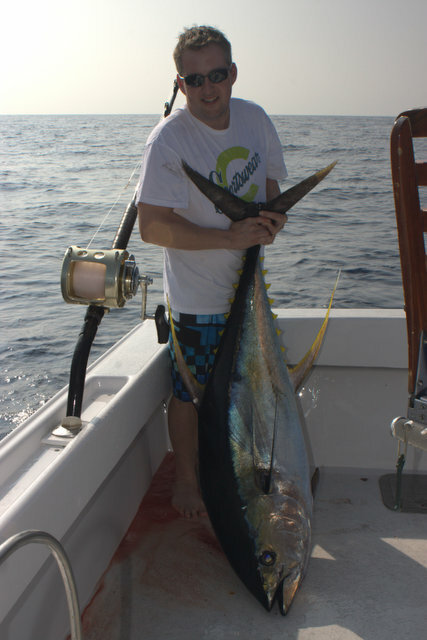 His first ahi would scale out at 119lbs! We ran back to the porpoise and set-up the greenstick. By now several other boats had spotted us and were working the pod. I knew there was at least one more fish so we started our second pass. It didn’t take long before another ahi blasted completely out of the water and ate one of the squids! KC saw the whole thing happen and she yelled out “Holy S#$T!” As Sheldon and I turned around all we saw was the huge hole it left as it landed back in the water. This time KC was up and she got to work on her first fish of the day. 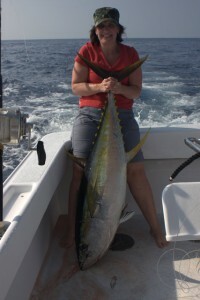 She did a great job and was surprised how hard these big tunas can fight. She landed her first ahi in about 10 minutes and it weighed 79lbs! We set up again and worked the pile but I didn’t see any more fish in them on the sounder. There were now about 8 other boats fishing the pod so I decided to look for something better. As we trolled farther south we had a spearfish attack one of our lures about 8 times and the hooks just didn’t stick. As we headed back up the line a nice mahimahi ate the long rigger and gave us a series of nice jumps. 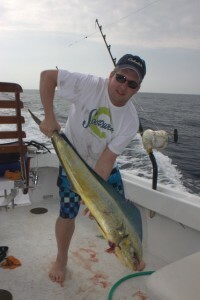 Sheldon was up again and fought his first mahi to the boat that weighed about 17lbs! It was a great day with some real quality fish! The bite is on and should only get better!